I never thought my son and I would bond over HGTV’s Beachfront Bargain Hunt. Of course, thirteen years ago when he was born I was simply trying to keep him alive. And not run myself into the ground trying. But here we are all these years later hanging out and watching a real estate show where buyers tour three, sometimes four, houses and then decide which one to buy. Why have we bonded over this show? Because I certainly couldn’t bond with him over Minecraft and Pokemon. Plus, It’s fun to hear the buyer’s wish list and budget, peep inside other people’s houses, and then guess which house the buyer will pick. Oh, who am I kidding? We bond by poking fun at the buyers’ rock-solid wish list, supposed budget, and then the compromises they make on both their rock-solid wish list and their budget. Together, my teen and I have made some scintillating observations from watching Beachfront Bargain Hunt. It’s our honor and duty to share these with ya. First, there are no “bargains” on Beachfront Bargain Hunt. These people are paying more for a “bargain” beach home than I paid for my everyday house. Second, the buyers ALWAYS comment on big bath tubs. “Ooo, honey, look at that bath!” they’ll say. What adult takes a daily bath? I haven’t since I was eleven. Plus, my mom has one of those huge Jacuzzi tubs in her house and NEVER uses it because it takes two hours and 527 gallons of water to fill up. Third, the buyers ALWAYS comment on the entertaining space. Who are these people? You’re moving to the Dominican Republic away from everyone you know because you love the beach. You have no friends anymore to entertain. And aren’t you always going to be at the beach? Moreover, as an introvert, I object to all that entertaining. I would want a nice place where it’s quiet and I can sit with a good book. Fourth, most of the buyers SWEAR they want a single family home. Fast forward twenty minutes and their moving into a condo with a gorgeous view of their neighbor’s patio, but they’ve got a big bathtub and plenty of space for entertaining. Finally, the buyers on Beachfront Bargain Hunt ALWAYS cave on their budget. “I know my budget was $650,00,” they’ll say, “but we just fell in love with Playa del Cocos Locos and we had to have it at $1,200,000.” Uh huh. 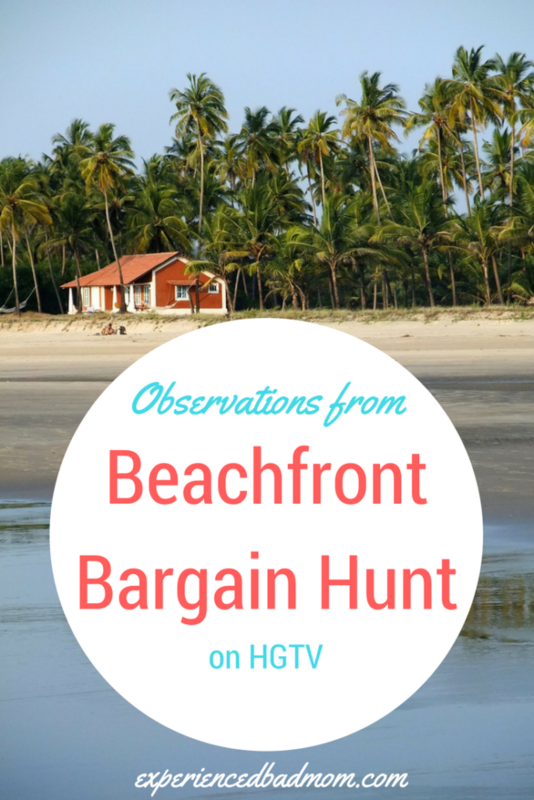 Do you watch Beachfront Bargain Hunt or its various iterations like Lakefront Bargain Hunt, Island Life, Caribbean Life, House Hunters, House Hunters International, and more? Why do you watch? It must be a Canadian thing but I do have a bath every day. At the end of the day I soak in the tub! Yup. So don’t be concerned that your new cottage getaway’s bathtub won’t be used for anything other than rincing out the suits. You see I will come visit. Promise. Won’t stay for longer than 3 days because like fish, guests tend to get a bit “smelly” if they stay much longer. Or so my sister, the one with a beachfront getaway, advises me. She lets me stay longer but I’m family. Do you have “Love it or list it?” I used to watch that but it’s too predictable. The house that’s being renovated always Hass hidden fault that requires the owner to cough up thousands which means there’s no more money and the “downstairs powder room” can’t be renovated. Always. Pfffft – Has for Hass! We DO have Love it or List it. I think my recollection is they always love it. All those memories of being in the old house trump any sort of new house that David can find. BTW, I do love how many Canadian couples from Edmonton appear on the beachy shows. Just goes to show there is only so much arctic wonderland a couple can take. I am a little obsessed with these shows. How in the hell do they manage these crazy budgets!? kristin mccarthy recently posted…What’s Happening With The Environment? Oh Right, It’s Dying. Yes, those crazy budgets make me laugh. Why they ever put “bargain” in the title is beyond me. Just call it, Beachfront Vacation Home or something. I love all of those shows in large part because I love to judge the people buying the homes. I especially love the folks on the Tiny House shows who SAY they want a tiny house but also want full-size stainless steel appliances, a king bed, and a work-out room. I have watched a view times and my jaw always falls open at the budget these people have. I’m all, “What? Our budget was like $150,000!” I don’t think $500,000 is a budget. That basically means you’re rich. “I don’t think $500,000 is a budget. That basically means you’re rich.” – YEEESSSSS. I recently saw some tweets where people were teasing the couples who appear on these shows about their jobs, too. Like the husband is a hamster wrangler and the wife knits socks for ebay and they’re budget is still $500k, lol. Lol! There are so many things I relate to here. Trying to keep son alive? Check (It’ll be a miracle if my climber makes it to adulthood) And it definitely seems like every budget on home buying/renovating shows gets completely blown. Thanks so much for sharing at the #happynowlinkup! Ha ha – yes it was hard keeping up with my boy when he was little! The fact that we can sit down together for 30 minutes is a miracle. I’ve watched that show a couple times. I like looking at other homes, even if there’s no way I’ll ever be able to afford it. You’re right on all accounts about the conversations that go on. It is fun to peek in other homes. Unless I remember what it was like 6 years ago when I sold our first home. I cringe at the memory of people walking through and picking things apart. HILARIOUS. Cass and Cade watch ALL the HGTV shows!! They are obsessed with them! The running favorite is that one with Chip and Magnolia I think? They buy nasty homes and transform them into UNBELIEVABLY gorgeous homes in one lovely hour long show. WHO HAS THAT KIND OF MONEY???????? LOL, “it saves you playing minecraft”. So right you are! My husband and son bond over hockey. I leave that to them! I’m good for about 15 minutes and it has to be the playoffs (so it has to count). The buyers do change their minds, don’t they? I think it’s like the brides who want a very specific dress they saw in a magazine and then when they try it on, it’s a no. I am addicted to these shows and DVR them if I can’t stick around to see which one they pick. I need like a 12-step program. 4) the requisite sequence where the family has high adventure in their new location totally making the fact that they left everything and everyone they know behind A-ok. Yes to 1-4! How could I forget about the water or view? And they’re always disappointed when one window looks out at a parking lot, even if it is the 3rd guest bedroom LOL. So I haven’t watched the show but I know exactly what you’re talking about. The bathtub. Who cares about the bathtub?? You know what our bathtub is for? Hanging sweaty running clothes over the side and occasionally scrubbing out the nasty rug from the kitchen. That’s it. Currently giggling at the image of your bathtub in my mind!